As Christmas creeps ever closer, David T. Smith takes a gander at our festive treat gin lovers - Yuletide Gin! When you’re a child, one of the main thoughts that preoccupies you in the run-up to Christmas is... THE PRESENTS. But as you grow older, attention tends to shift, albeit slightly (after all, who doesn't like a present? ), to focus on the food and drink of the season. People like to pull out the stops for the Christmas period in the true spirit of hospitality. 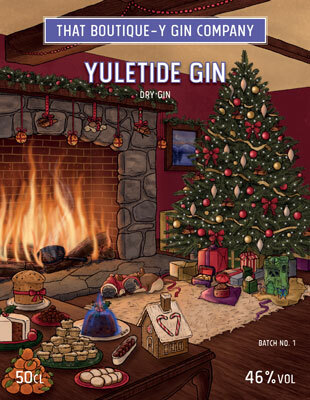 At That Boutique-y Gin Company, we’ve taken the same approach to our latest product: Yuletide Gin. *Well, edible gold flakes which are added after distillation and give the spirit a snow-globe quality. The gin’s label depicts a snuggly scene with two lovable dogs, suitably festively attired, asleep in front of a roaring fire. Dotted around the room are all of the various items that have been distilled to make the gin; under the tree are the gifts of gold, frankincense and myrrh, as well as a Castle Greyskull (for those of a certain age, the must-have Christmas toy of their childhood). However, please note that, as the bottle says, there is no Castle Greyskull distillate in the gin. When all is said and done, this is an exceptionally complex spirit with lots of hidden flavour nooks that reveal themselves over time. Adapted from the book “Gin Tonica” by TBGC’s very own David T Smith. Garnish with a colourful skewer of dried fruit: cranberries, raisins, and apricots. A simple, but incredibly effective drink, and a good way to use up all of those little fruit nibbles dotted around the place in crystal bowls atop dollies. The tonic really brings out the spice and fruit of the gin. Another cocktail full of Christmas spice with plump, sweet citrus that perfectly complements the complex spice of the gin. The ginger adds body and additional spice, whilst the lime adds just enough bite to stop it from becoming overly confectionery in nature. Add the gin to a champagne flute and top-up with the wine; a twist of orange peel makes a pleasant garnish. A glass of fizz in a Champagne flute makes for a great festive start to the big day and just a splash of Yuletide gin is a fun addition. The gin not only adds a spiced complexity but, if you’re lucky, the gold flakes dance up and down in the bubbles, too - mesmerizing. Shake with ice and strain into your cocktail glass, before garnishing with a little grated nutmeg. A variation on the chocolatey and creamy Alexander, using Yuletide Gin to provide extra spice. This cocktail really seems to bring out the gingerbread elements of the spirit. For a dryer drink, try using Mozart Chocolate Spirit instead of Creme de Cacao. A warm winter drink, perfect for warming the cockles after a cold night out carolling or whatever you like to get up to. The Sherry add a rich fruitiness, which is a great complement to the gin’s spiced notes; whilst the lemon juice adds balance and the water both adds warmth and lengthens the drink. Overall, Yuletide Gin is a festive treat with plenty of mixing possibilities; a bit of fun for Christmas and a perfect spirit to share with loved ones. Best Old Tom at the Craft Distilling Expo! That Boutique-y Gin Company has snapped up a host of accolades at the London Craft Distilling Expo Gin of the Year awards – including Old Tom of the Year for our Very Old Tom! 2017 marked the fifth edition of the Craft Distilling Expo Gin of the Year Awards, and from almost 80 entries That Boutique-y Gin Company was recognised with a slew of ‘Highly Commended’ nods, alongside the big one: that Old Tom of the Year award. A panel of judges assessed all the gin entries in strict blind tasting conditions over two rounds. Only the best in class were put forward to the second tasting, and we’re delighted that our wonderful Boutique-y Gin bottlings performed so well! In the Classic Gin category we were awarded not one but two high commendations, with Shortcross Estate-foraged Gin and Moonshot Gin both impressing the panel. ... as did our Greensand Ridge Cobnut Green expression in the Contemporary Gin category. But it was our Very Old Tom that really stole the show, picking up the Old Tom of the Year accolade and beating off the all competition. It’s an incredibly exciting set of wins for us and our marvellous friends at Shortcross Estate and Bathtub Gin. Time for a celebratory G&T, anyone? Who doesn’t love cherry? This plump little stone fruit is a popular flavour in a lot of food and drinks: from cherry bakewell to cherry cola, and cherry pie to cherryade. But what about something a little bit stronger than bottles of fizzy cherryade pop? There’s dry Kirschwasser, super-sweet Cherry Brandy (a particular favourite of my great grandmother - for medicinal purposes only, of course), and now there’s something in the middle: Cherry Gin. Whilst the gin is extremely sippable over ice or served frappe with a wedge of lime, it really shines in mixed drinks. The most obvious (and slightly controversial) of which is with cola. Add ingredients to a well-iced glass. The rich and juicy cherry notes are perfectly offset by the light twang of lime, which adds balance and zest. A simple, but refreshing drink. Add a straw, sip and enjoy. This drink is an indulgent treat and a nice alternative to a dessert. No ice is needed, so it is neither too cold nor too watery. A light and refreshing drink with tart zestiness from the lime; sweet, fruity, jammy nature of the cherry; and intriguing, dry hints of dry gin botanicals on the finish. Balanced and moreish. A slightly dryer and more complex version of the Old-Time Cherry-Chocolate Float, with the coffee adding dark, bold flavours and a hint of bitterness that balances out the sweetness of the fruit gin. These are just a few ideas for drinks using the Cherry Gin, but there are plenty more to be discovered. Chocolate and cherry is a great combination to try, but - perhaps unexpectedly - cherry and basil is another winning partnership, amongst many others - there are so many possibilities! That Boutique-y Gin Company's Advent Calendar! September has only just arrived, but that doesn't stop us from being excited about our very own Drinks by the Dram Advent Calendar - which you can pre-order right now! Christmas is coming, and though the goose may not be very fat quite yet, we're feeling very festive indeed. Why? 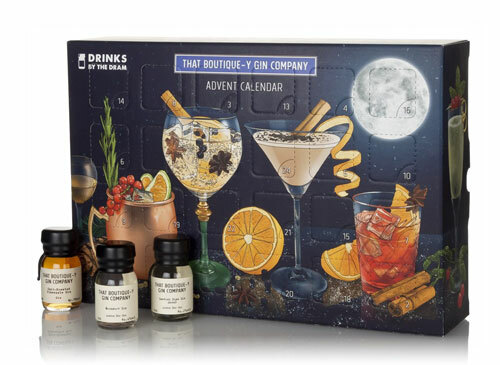 Because Drinks by the Dram have just announced their selection of booze-filled Advent Calendars, and this year (our first Christmas), we have our very own Advent Calendar! Regard with awe - it's That Boutique-y Gin Company's Advent Calendar. Within this wonderful cardboard cuboid you'll find 24 hand-waxed drams of That Boutique-y Gin Company gins - some indie bottlings from talented producers around the world, some of our own creation and some completely new releases that haven't even seen the light of day yet! The Christmas countdown just got a little more delicious. These little rascals are available for pre-order right now, so you know what to do. Now, if you'll excuse us, this tinsel isn't going to staple itself to our desk fans. Swedish Rose Gin Wins Big! Our Swedish Rose Gin from Hernö has claimed the London Dry Gin Trophy at the International Wine & Spirit Competition 2017! We barely had time to organise our huge haul of medals from the Gin Masters in our trophy cabinet before having to rearrange them all to make room for a massive prize - the International Wine & Spirit Competition judges have awarded our Swedish Rose Gin from the esteemed Hernö distillery the coveted London Dry Gin Trophy! As you might expect, we're absolutely over the moon - in fact, we're so excited that it'd be fair to say that we're over a selection of moons from other planets, including Ganymede, Enceladus and Phobos. There was plenty of competition, with about 400 gin entries and around half of them being London Dry, making this a massive win for ourselves and the brilliant Hernö chaps. "Complex, classic, intense nose that is bright and lifted. Intense, citrus, juniper heavy pronounced nose personified. Incredibly intense, vivid and fresh in the mouth, zesty, powerfully botanical with explosive flavour." During the second Golden Age of the cocktail (1950 to the 1960s), liqueurs and cordials were all the rage, as were fruit gins. These were dry gins that were infused with fruit before being sweetened. The most common of these were lemon and orange gins, which were made by the likes of Plymouth, Gordon’s, and Beefeater, but other flavours were popular, too, such as passionfruit, grapefruit, and - from a brand called “Dinner at Eight” - pineapple. As tastes changed and the Summer of Love shifted minds to other intoxicants, these fruit gins were confined to the annals of history; until now, that is. Inspired by the tales of old, That Boutique-y Gin Company have resurrected one of the fruit gins and given it a 21st century twist - the result is “Spit-Roasted Pineapple Gin”. Bottled at 40.1% ABV, the gin is made using whole, peeled pineapples that have been coated with demerara sugar and spit-roasted so that it caramelises. The base gin has a classic recipe, with botanicals including: Juniper, Coriander, Angelica, Orange, Lemon, Nutmeg, Cassia, Cinnamon, Orris and Liquorice. The two are combined and the result is a luxurious and devilishly indulgent liquid. The toasted sugar and caramelised pineapple are reminiscent of a pineapple fritter, whilst the brighter, juicer pineapple notes of the underlying fruit cry out to be mixed in tiki drinks. The pineapple has also long been seen as a sign of hospitality, and has been connected with gin for a long time - just have a look at the cap of a Tanqueray bottle - so it is perhaps surprising that there are not more pineapple gins. Pineapple Gin is a surprisingly versatile drink and mixes well with a variety of ingredients. For a straightforward serve, fill a tall glass with lots of ice, add a measure of the gin before topping up with your favourite mixer, be that tonic, soda water, cola, or - our personal choice - Ting. The grapefruit soda’s bittersweet flavours combine well with the tart sweetness of the gin. For a touch of decadence, add a splash of Pineapple Gin to a Champagne flute and add a glug of sparkling wine. For the more ambitious home bartender, here are some other ideas. A real taste of the tropics, with the light sweetness and grassy complexity of the rum. 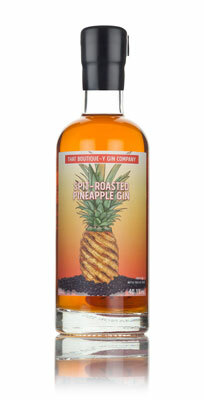 This adds to the flavour of the gin, which contributes a light sweetness and plenty of punchy pineapple. The lime juice intermingles with the the other fruit notes for a long, crisp finish. Inspired by the “Berlin Station Master” (a Martini with Islay Whisky) and the famous Canadian pizza that - controversially - combined ham and pineapple. This drink will likely prove as controversial as the pizza; the intriguing mix of peat smoke (reminiscent of smoked ham) and the sweet, juicy pineapple is quite the juxtaposition. The underlying botanicals add complexity and a slightly dry finish. Not content with these creations, we sought out Tiki expert, Jeff “The Beachbum” Berry, who has recently released the excellent Total Tiki app, which contains nearly 250 Tiki cocktail recipes. Jeff recommended the following drinks to try with the gin, which have been slightly modified. A fruity drink with plump pineapple notes at the start and a refreshing citrus twang on the finish - all with the perfect balance of sweet and sour. This drink has a slight pearlescent opacity thanks to the coconut cream (in a pinch you could substitute for normal milk or cream). 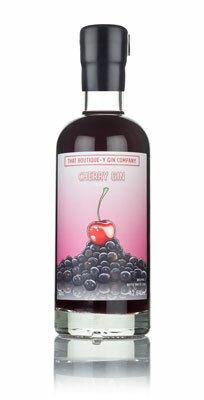 The drink is creamy, jammy, and fruity; sweet, spicy and dry - really leading your senses through a range of sensations. The cinnamon and gin also add a pleasant sweetness. Indulgent, but still refreshing. A good choice for those with less of a sweet-tooth. This has a lovely balance between the sweet gin and the tart lemon, making something akin to a White Lady with a tropical twist. Oh, it's also well worth mentioning that Spit-Roasted Pineapple Gin took home a prestigious Master medal at The Gin Masters 2017. Well happy about that, we are. 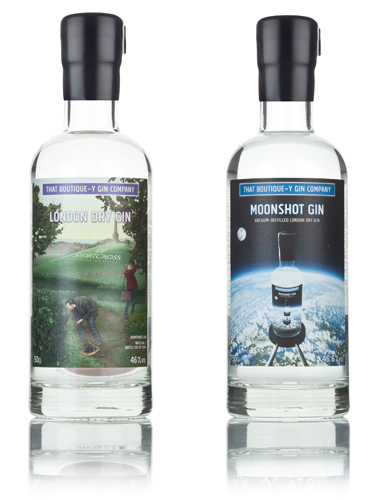 Grab your pith helmet, Golden Moon's Expeditionary Gin has arrived - David T Smith has a gander! Golden Moon distillery is located in Golden, Colorado (12 miles west of Denver) and is overlooked by the Lookout and Tabletop Mountains. The distillery was founded in 2008 by Stephen Gould, a man with vast array of career experience: from being a corporate executive to a bartender and saucier; he is also a retired US Marine. In addition to all of this, Stephen is a spirits and distilling historian and educator, not to mention a bit of a hoarder of distilling relics: he has a collection of over 20 stills, the oldest being from late 1800s, as well as over 600 spirits books and manuscripts, including original distillers’ notebooks. His oldest book dates back to the 16th century. Today, Stephen makes a wide variety of spirits, including: whiskey, absinthe, applejack, grappa, liqueurs, and other spirits. Of course, it is his gin that is the only concern of That Boutique-y Gin Company. The original Golden Moon Gin is a romanticised version of a real pre-Prohibition gin. Why romanticised? Well, Stephen only got a chance to taste it once and so had to work from memory to try and recreate it. When he eventually had the chance to try the original gin again, he realised that he had just remembered the good points and, as a result, his final gin was even better. The Expeditionary Gin adds a twist to this romanticised gin, sympathetically adjusting it to appeal to the tastes of the British gin-drinking public. The floral lavender has been dialled down and the gin is dryer, with the addition of citrus, menthol and the aromatic, peppery flavours of Grains of Paradise. Palate: Spicy fennel and floral lavender make way for crisp juniper, then some sweeter earthy notes. Given the gin’s bold character, Stephen himself likes to drink it mixed in a Gin & Tonic, but also feels that it stands up well to Campari and Red Vermouth in the creation of a rather zesty Negroni. You may also want to try it is a Perfect Martini (equal parts gin and vermouth) and use a Bianco (white sweet) vermouth instead of the more typical dry variety. 50ml Expeditionary Gin, 150ml Tonic Water - Twist of lime peel, spritzed over the top. Dry with crisp citrus and aromatic floral notes. The finish is a mix of lavender and lingering, light pepperiness. The twist of lime really highlights the drink’s zest and liveliness. 50ml Expeditionary Gin 20ml Lime cordial - Shake with ice and strain into a cocktail glass. An intriguing interplay of sweet and sour, and floral and pepper notes. This Gimlet is fresh, but not as tart as some others and the botanical flavours of the gin are more pronounced without overpowering the drink with juniper-pine. 25ml Expeditionary Gin, 3-4 splashes of Angostura Bitters, 120ml sparkling water - Serve over ice in a tall glass or goblet, garnish with a lemon and lime wedge. A tropical cooler, great to sip on a balmy afternoon. Whilst this is a less alcoholic drink, the botanical power of the gin certainly holds its own - just make sure there is a plentiful supply of ice. David T Smith introduces the official gin of World Gin Day from That Boutique-y Gin Company! Saturday 10th June 2017 is the second Saturday in June, which can mean only one thing - World Gin Day! This is actually the 9th annual event after it was founded in 2009 by Neil Houston. Since 2013, the Gin M.C. and Commander-in-Chief for World Gin Day has been Gin Monkey Emma Stokes. This year will see events organised in more than 30 countries. Obviously, a day like this does more than pique the interest of us here at That Boutique-y Gin Company and we were looking for a special way to celebrate. The answer was also obvious - as obvious as the gloss on a new silk hat (one for the H.G. 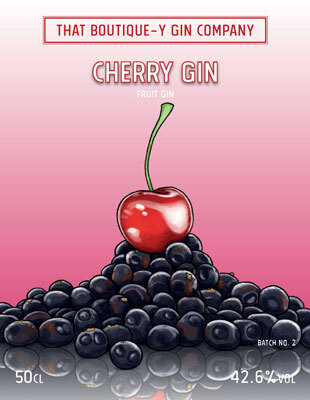 Wells fans) - let's make a gin! The plan for a World Gin Day gin began to form, but the question quickly arose of how to capture the World of Gin in a bottle? The decision was taken to source botanicals from each of the world's seven continents. Europe, Asia, Africa, Australia, and the Americas were relatively straight-forward, but what about Antarctica? Not much grows in the ice desert and there are few local plants, most of which are mosses or lichens; the only two flowering plants are Antarctic Hair Grass and Antarctic Pearlwort. So could we use these? Cogs were audibly whirring in our brains to find out how we could source them: charter a helicopter? Befriend an Antarctic researcher? Unfortunately, we then discovered the Antarctic Treaty of 1959, which severely restricts - essentially outlaws - the removal of anything from the continent. At this point, we might as well have been trying to source a botanical from the ice planet of Hoth. In the interim, we had identified our botanicals from the other continents: Europe - Juniper Africa - Liquorice Root Asia - Cinnamon Oceania - Coriander North America - Angelica Root South America - Lime So that only left Antarctica and we had to get creative. One thing that can freely leave the continent (other than penguins, but I don't fancy putting Pingu or Mumbles in a bottle) are currents of water. Out came the nautical charts to find a place where we could harvest waters originating from the Antarctic Ocean and provide our seventh botanical - a tiny pinch of sea (or ocean) salt that is added to the gin post-distillation for a polar lift. Best Spirits Design and Packaging 2017! That Boutique-y Gin Company was the winner for Best Design and Packaging for Spirits at The Drinks Business Awards 2017! It gives us *enormous* pleasure to announce that at The Drinks Business Awards ceremony, which took place yesterday at the London Wine Fair Olympia, we were named winner of Best Design and Packaging for Spirits 2017! We're absolutely made up that our recently launched brand has been recognised among such incredibly tough competition. Speaking of launches, That Boutique-y Gin Company also received a Special Commendation for Launch of the Year! Enormous thanks, of course, go to the incredible Grace J Ward for turning all of our bonkers ideas into the extraordinary illustrations you see on our fun and informative labels. The reception that the design and packaging, as well as the all-importatant liquid itself, have received since February has been amazing across the board from gin enthusiasts and bloggers, to drinks press, to featuring in gift guides from the likes of GQ, Stylist and The Guardian. A huge thank you to everyone who's shown an interest in our unique and exciting gin project (that includes you!) and watch this space for further awesome releases very soon! We’re very excited to announce that we’ll be joining forces with SpaceX for a brand new out-of-this-world tipple - Martian Gin! Following the roaring success of our Moonshot Gin (made with moon rock and botanicals which have been into near-space), we had to take a good look in the mirror and see what kind of people we had become. Were we the sort of people to step away from the table with just one space gin under our belt, or were we the sort to roll up our sleeves, hoist up our trousers and double our number of space gins? After a few phone calls, napkin diagrams and a rewatch of Total Recall on VHS, our newest idea was underway - we’re teaming up with Elon Musk’s SpaceX to create Martian Gin! Known for making huge leaps in the quest for the colonisation of Mars, we knew they were the obvious choice to help us make Martian Gin a reality, and we couldn’t be happier that they have agreed to take a payload of our botanicals all the way to the surface of the Red Planet and back. Following that long, long, long journey (which will be taking place (weather permitting) in October 2019), we’ll be vacuum distilling those botanicals at room temperature for freshness and elegance to create the gin. But that’s not all. SpaceX have also agreed to scoop up a handful of Mars Rock and bring it back for us to use as a botanical! Should this venture go according to plan, we hope to be able to extend our methods to other planets, allowing you to taste Uranus, Saturn and Jupiter. The future is almost here, folks. Keep watching the skies. David T Smith heads to the east of London to take a peek at East London Liquor Company's citrus-fuelled gin. Housed in an old glue factory (thankfully they make something much tastier now), East London Liquor Company is one of the few distilleries in London that makes more than one class of spirits; they are currently ageing their rye whisky, but - perhaps more important for our purposes - they make fantastic gin. The distillery opened in 2014 and now boasts a bar, restaurant, bottle shop and, of course, a distillery. For their edition of That Boutique-y Gin Company, founder Alex Wolpert and Gin Distiller Tom Hills decided to embrace a refreshing flavour: citrus. Luckily for the chaps, there is a local citrus trader who could help take the gin beyond oranges and lemons (regardless of what the bells of St. Clements might think). Instead of more typical citrus, they sourced fresh lime and fresh miyagawa for their botanical mix. The miyagawa is a rather mysterious fruit: on the outside, it’s green like a lime, but when you cut it open, it’s orange and looks like a satsuma. This colour-changing fruit originates from Asia, but is commonly grown in Sicily. It tastes like a cross between a grapefruit and a tangerine. The citrus is accompanied by Douglas Fir - no, not the silent film actor, but the coniferous tree - that adds a crisp, green, resinous flavour that really complements the juniper, an essential part of any gin. The resulting spirit is sparklingly bright with an array of citrus and luxurious creamy notes. It works exceptionally well in a Gin & Tonic float with lemon sorbet. The label shows Alex and Tom in the distillery sipping on Martinis, Tom has olives, Alex has a citrus twist - conflict that perhaps will never be resolved - so let's leave them to it. In the background is the beautiful set of stills, one for whisky, one for gin. The centrepiece is a citrus medley tree that has nonchalantly sprung forth between the two chaps - but they seem to be enjoying their respective drinks too much to notice! Nose: A fruit basket of citrus - bold and zesty. Taste: Marmalade with a little creamy butteriness, reminiscent of a morning slice of toast. Finish: Mellow with a biscuity element and long-lasting, citrus zing. Hernö gin is made in the tiny hamlet of Dala; not many settlements can boast just four houses and a world-renowned gin distillery! Dala is just north of the island town of Malmö in central Sweden. Hernö Gin was started by ginsmith, Jon Hillgren, in 2011 and has since won a plethora of awards: from a hoard of gold medals to the IWSC’s World Best Gin & Tonic, World’s Best Contemporary Gin, and, last year, World’s Best Gin Producer. One of the award winners was Hernö Juniper Cask, a unique and quirky gin that's aged in casks made not from oak, but from juniper wood. The wood (juniperus occidentalis) has to be specially imported from the USA and is then turned into Ankare barrels by a local cooper. The wood adds indulgent, resinous wood notes to the gin, as well as turning it a light straw-gold in colour. Batch 1 of That Boutique-y Gin Company’s Hernö Gin takes inspiration from their Juniper Cask Gin by first aging some neutral spirit - the base spirit used for their gin - in a juniper cask. The botanical mix of Batch 1 is similar to that of Hernö Swedish Excellence Gin, but the meadowsweet and lingonberries have been dialed down and a new floral flourish added to the mix with the use of dried rose petals. The rose petals have a pinkish-purple hue and are added straight to the pot still just before it is fired up - who says you can't distill rose, ey? Once the distillation run is complete, a little of the juniper cask neutral spirit is blended in, adding texture and a cosy finish of woody pine. The gin label shows friends and colleagues, Jon Hillgren and David T Smith, in a heated exchange over the best use for some freshly harvested juniper wood: Jon wants it to feed the fire under the still, whilst DTS is interested in making another barrel. The onlooker in the background is impartial in the debate, happy to sip on a garishly-coloured cocktail and remain, as ever, Pontius Partridge. Taste: A luxurious, silky-smooth texture. Turkish delight, juniper jell, fresh berries and cream. Well – it’s been some time coming, but we’re finally here. That Boutique-y Gin Company – sister company to the hugely successful That Boutique-y Whisky Company has finally launched, and boy, do we have some big shoes to step into. It’s fair to say that this project has been on our minds for a fair while, and we wanted to take the time to explain the company’s ethos, and a bit more about the bottlings you’re going to see coming over the following months and years. With the recent ‘gin boom’ showing absolutely no signs of abatement, the number of entrants into the market has been absolutely vast. Snap back 5 years to 2012, and there were probably no more than a few dozen gins available in most markets. Today in our home market (the UK) alone, there are over 1,200. It's fair to say, however, that (with a few notable exceptions) most distilleries are putting out just one or two expressions of their gin, and that whilst they may have thousands or even millions of loyal fans and customers – the ability to put time, effort, and cash into the development, marketing, and distribution of new and exciting lines is severely restricted for all but the best-funded or most hyperactive of distilleries. We got talking to several of our favourite distillers, and time after time heard the same story. The story about the super-exciting liquids that were either fully or partially developed, but hadn’t been released due to a lack of time to bring them to market, a lack of resources to develop different packaging, or concern about dilution of brand-message in an already-saturated market. The fact that these liquids were languishing in a black-hole of inability to get into our mouths made us sad as consumers – and it’s something that we wanted to fix. And that’s exactly what we set out to do. We’re working with some of the world’s most exciting brands (both well-established, and new entrants) to both bring to market extant ideas, and to create new liquids from scratch. Some of the gins will be fascinating tweaks to the distillery’s normal recipe (maybe using a different citrus blend, or re-balancing and dialling up the botanical intensity to work better in more assertive cocktails), many will be taken directly from the extensive list of ‘things to try’ written on the notepad or blackboard of each and every distiller that’s ever lived, and some will be completely balls-out-of-the-bath experiments that we hope will resonate with our customers in the same way as they did with us. For each of our limited-edition individually numbered batches of gin, there’ll be a blog post from our very own David T Smith in conjunction with the distiller, explaining the thinking behind each release, and sharing some of the fascinating story behind its production. As with every ostensibly simple idea, the reality of getting to this stage has of course been a mammoth amount of effort from all involved, and we’d like to take the time to thank all of the distillers that had faith in the idea, and have helped us get to launch. Rest assured there are many, many more super-exciting gins already in the pipeline, you lucky, lucky lot.